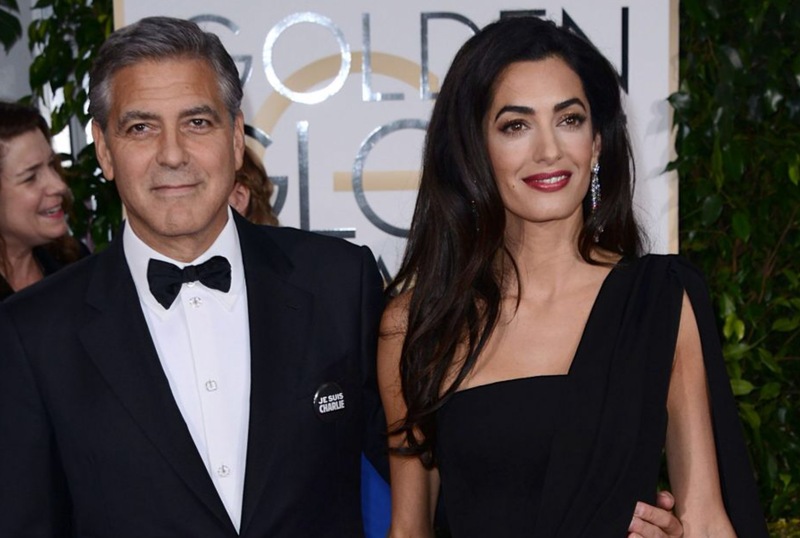 Tonight, Amal and George Clooney arrived in black and white with “JE SUIS CHARLIE” pins, a statement for the tragic events of the week. 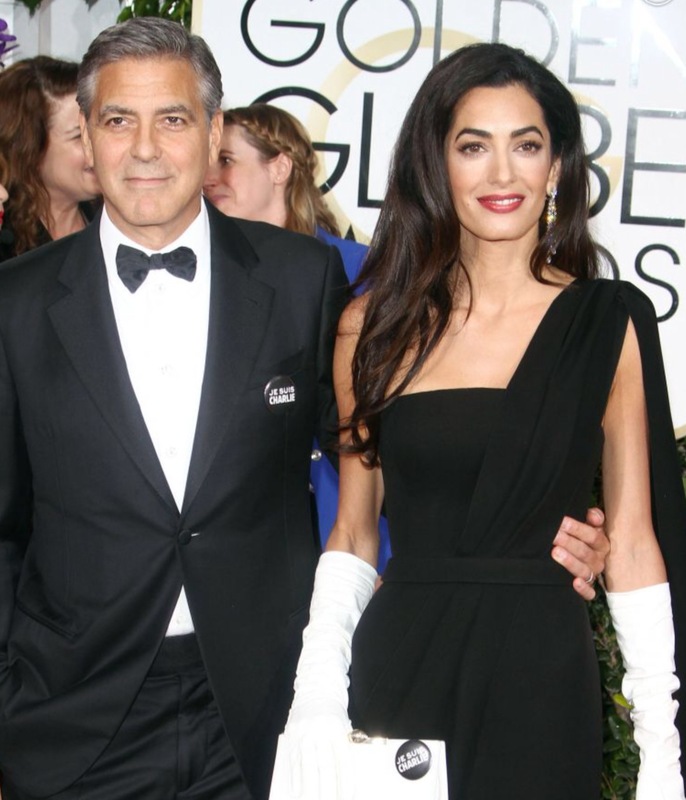 Amal Clooney wore a train black dress by Dior Haute Couture with a Dior white clutch and Harry Winston diamonds earrings. 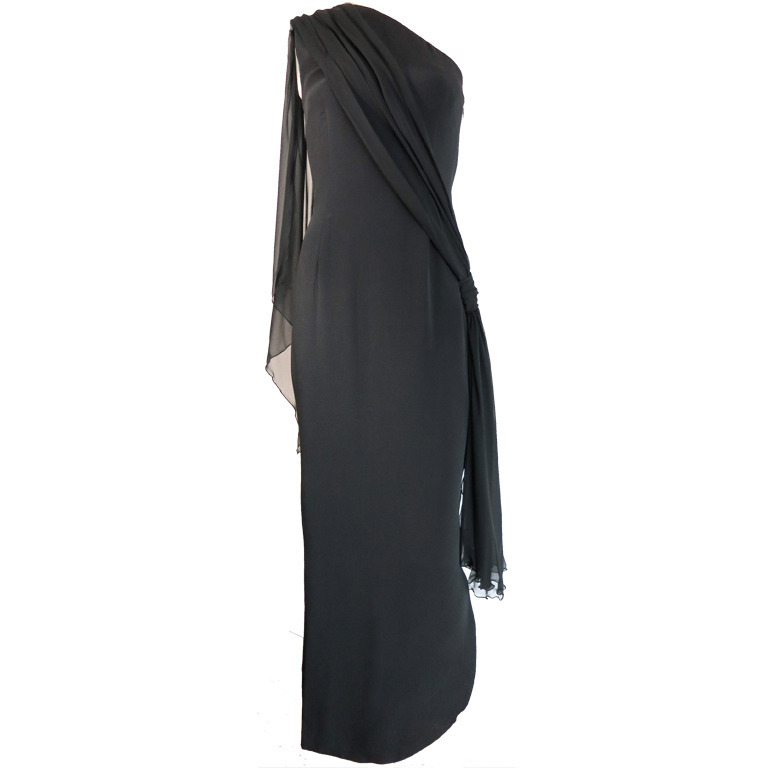 For the dress, I found this vintage Dior dress, so beautiful and so “Amal”, 475 USD. She looks beautiful, it’s just a shame the gloves look to big on her. Yes, they are too large. Indeed, she looked amazing ! 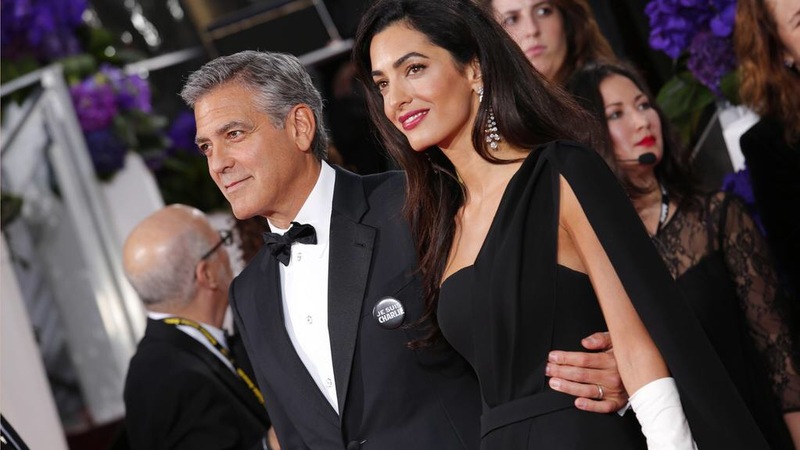 Indeed, Amal is beautiful and naturally elegant. She exudes class and style. 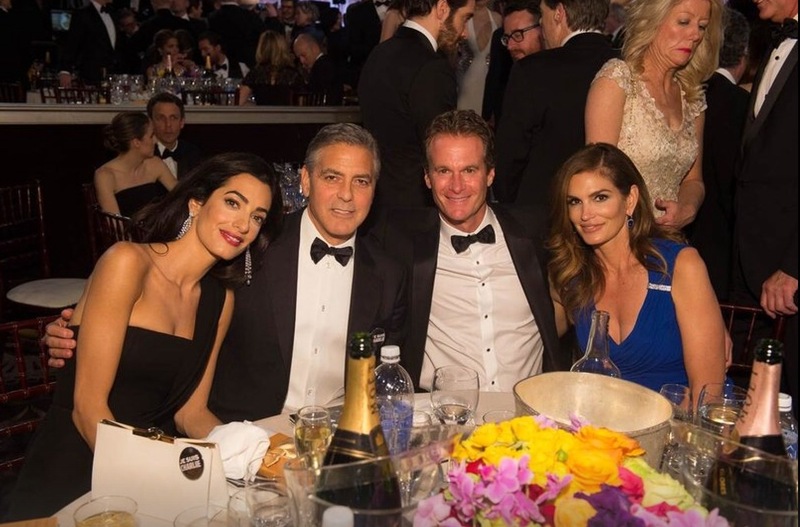 I know she has always been thin, but these recent Golden Globe photos look like she is worryingly thin now. Her arms and waist don’t look healthy for a woman her age and build. Maybe it is from being nervous from suddenly thrust in front of the world’s cameras? I prefer her in a black shinny gone like that one in Venice, shinny black give her a better fresh look. Although she is beautiful in this dress also. 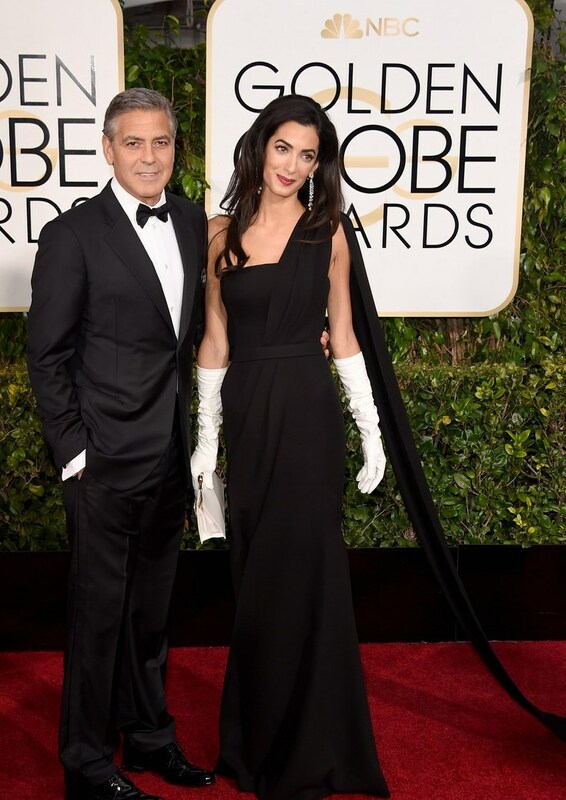 This kind of gloves for me has to be a bit large , otherwise you feel suffocated with them 🙂 I like very much George and his speech was fabulous. 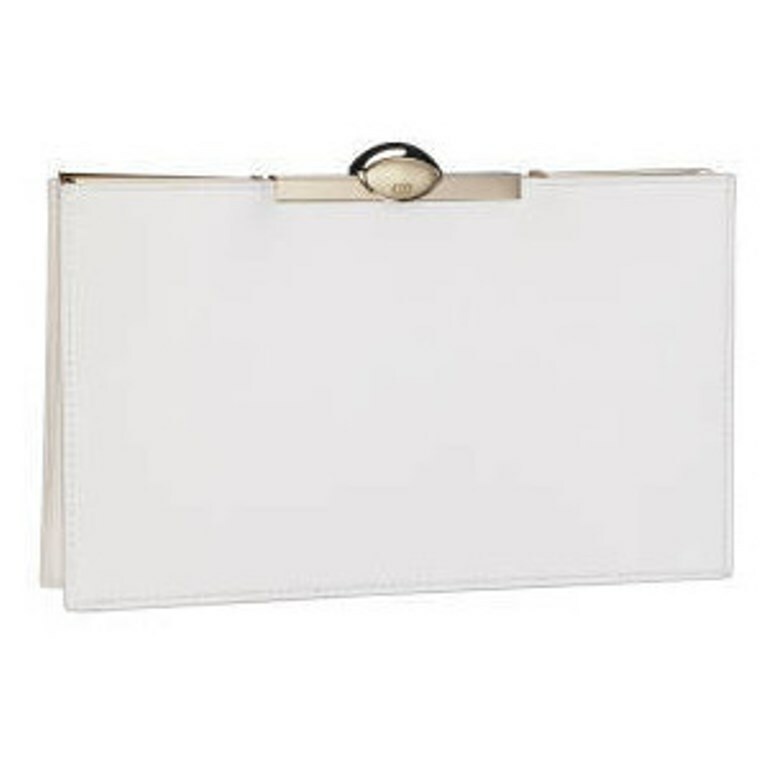 She didn’t want to steal the show, so she choose a classic and elegant look. The make-up was perfect 🙂 Charlotte Tilbury is a genius. At first I didnt like the gloves but then realised they were leather and then..well..I thought it was a fantastic combination. She is a very striking woman. 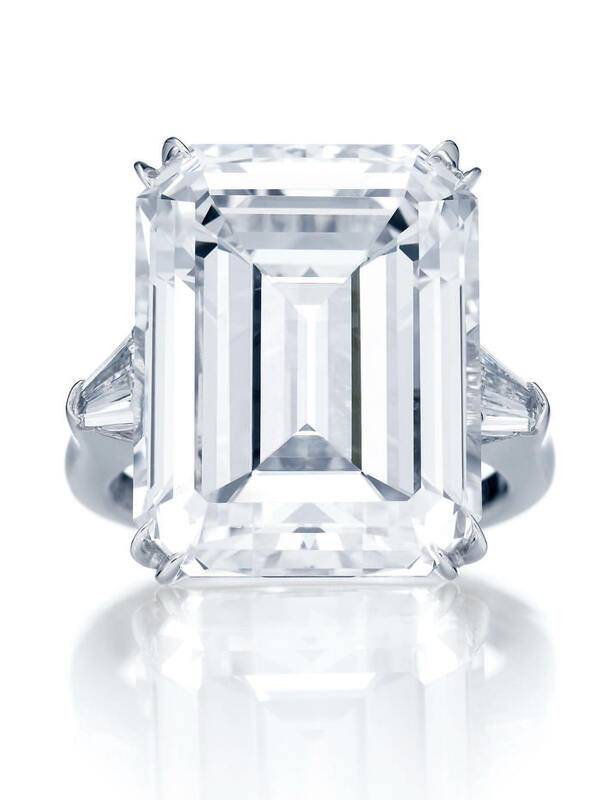 Definitely old Hollywood very classic and chic. 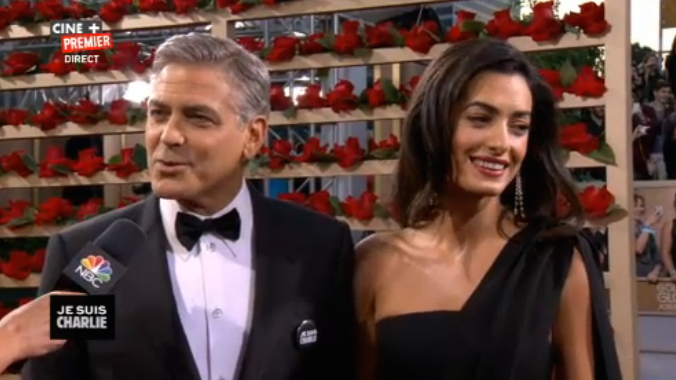 Amal was amazing. 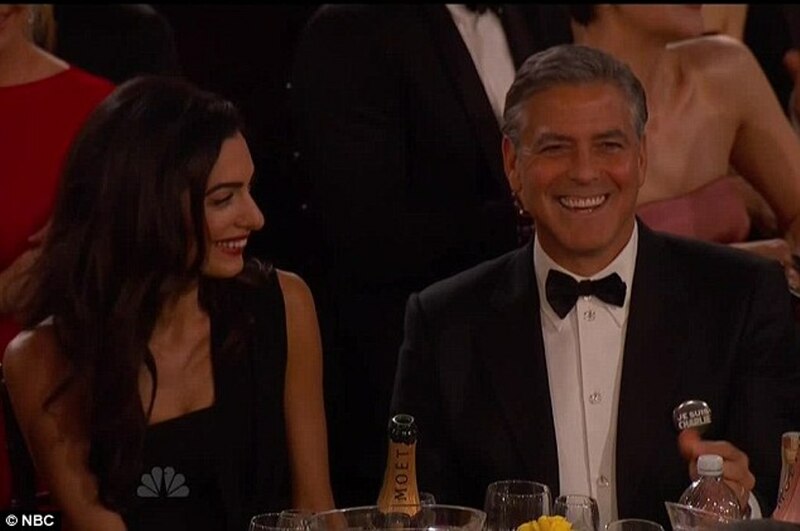 That speech ..George spoil Amal! I completely agree Jill. 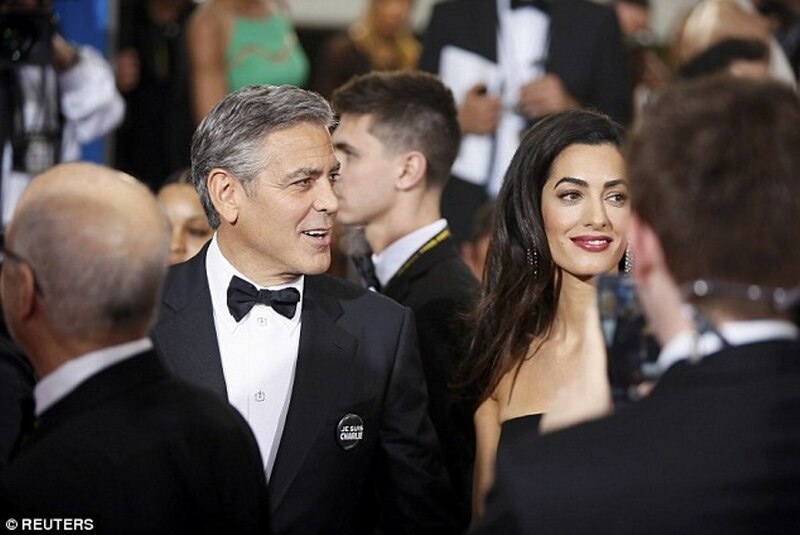 As much as I love Amal and her style, she’s looked better at other events. Wasn’t crazy about the dress and she could have picked a different color and still be understated. Her hair wasn’t the best it’s ever been , who knows maybe it was the humidity that day, but I just didn’t think she shined . That being said, we ALL have our off days and she’s still a striking woman with a sweet disposition, but she’s looked better…. I was disappointed I must admit. 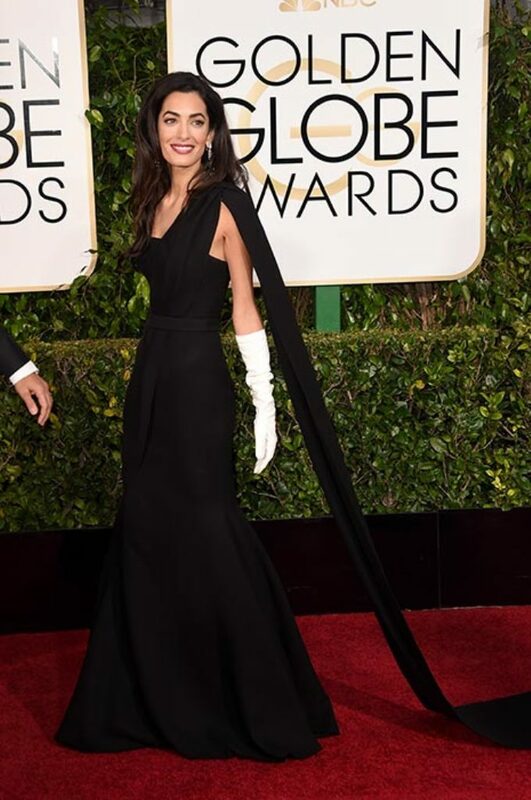 Too harsh in terms of contrast and way too much going on for her delicate frame – the white gloves, the long dark hair, long dark train, long dark column dress. Just sweeping her hair behind her shoulders helped to break it up. 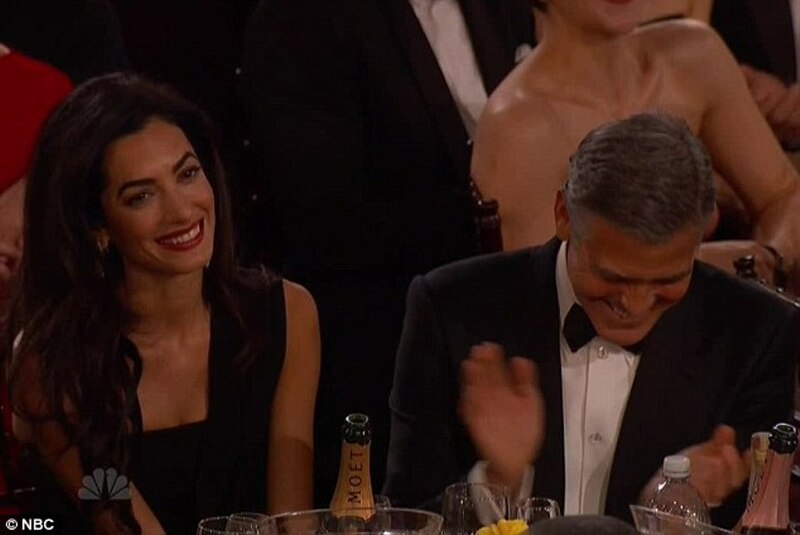 I also felt for her, the red carpet experience seemed so awkward, all the jokes about GC’s relationship history, lack of commitment, now “off the market”. I would have found it offensive. I hope she wasn’t overwhelmed with it all, it appeared so to me somewhat. I liked the outfit *a lot,* except for the earrings. 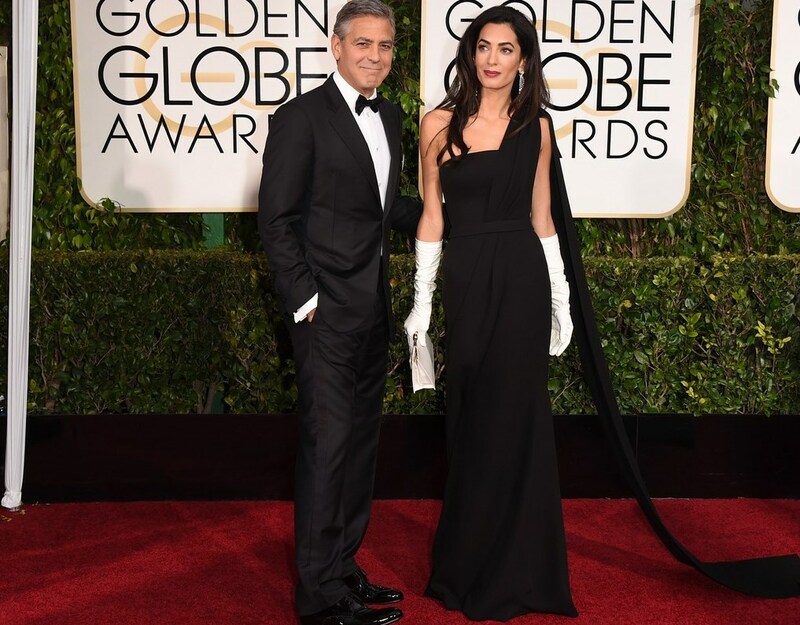 The gown, the gloves, the makeup, and the clutch – that was magnificent. 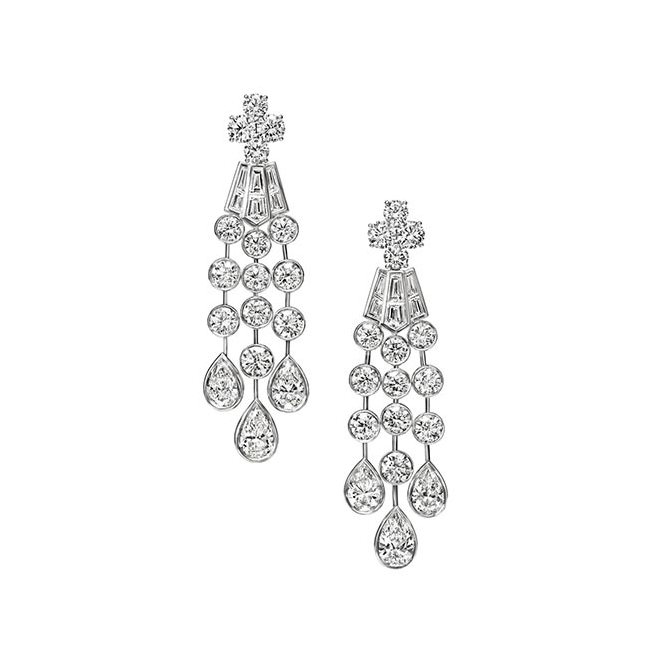 The earrings were boring, in my opinion. Almost every clothing store that caters to high school girls sells cheaper earrings made with crystal/plastic that look exactly the same. Plus, diamonds are an ethical nightmare. 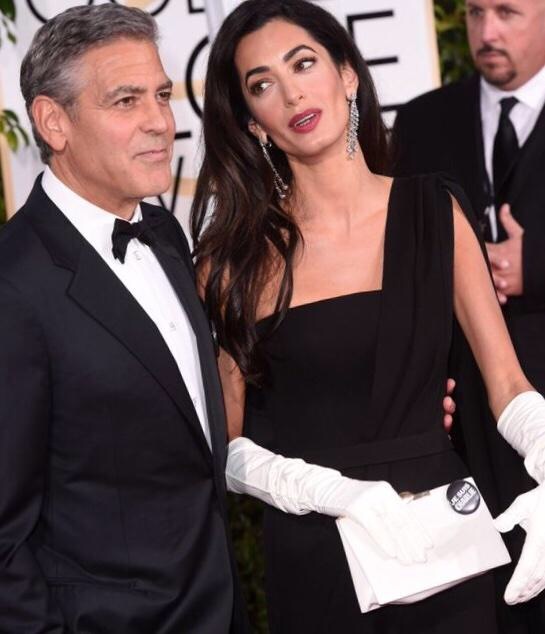 Amal could do better in the jewelry department, in general. 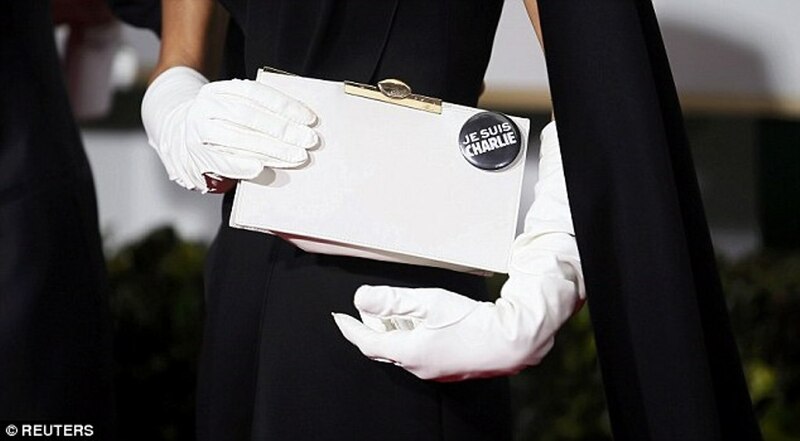 Regarding the Hollywood show of support for Charlie Hebdo – that’s wonderful. But, it also would have been nice to have heard words of sympathy for the folks who have lost loved ones to unjustified police violence this past year (spawning massive protests in the U.S.). In fact, the same day that the massacre at Charlie Hebdo occurred, a NAACP chapter office was bombed, likely by a white supremacist terrorist in Colorado, but no one seems to give a damn. Why is that? Perhaps Hollywood should notice the problems that happen at home, as well, including and especially racism that still persists. 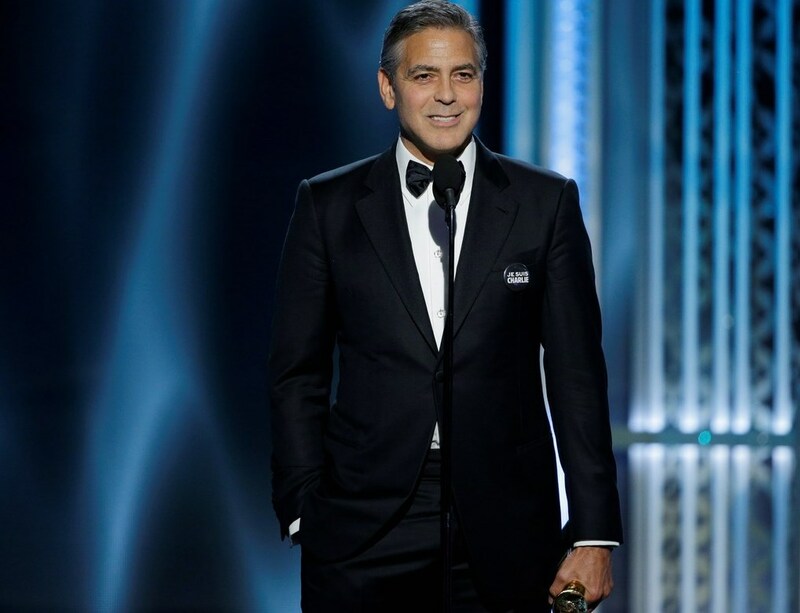 The only one who broached any such matters was Common, when he and John Legend were on stage. Thank you, Tack. 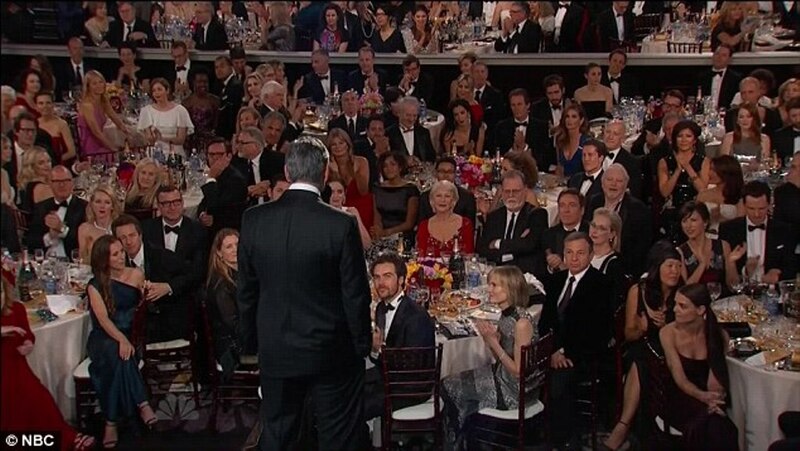 It’s sad that Hollywood is still such a bastion of [white, male] privilege that so little attention is given by them to issues that affect persons of color here in the U.S. at events like this. I know the common perception of Hollywood by some folks is that Hollywood is supposedly “liberal,” but often the movies and TV shows produced there just seem to reinforce the societal status quo because that makes the most money. 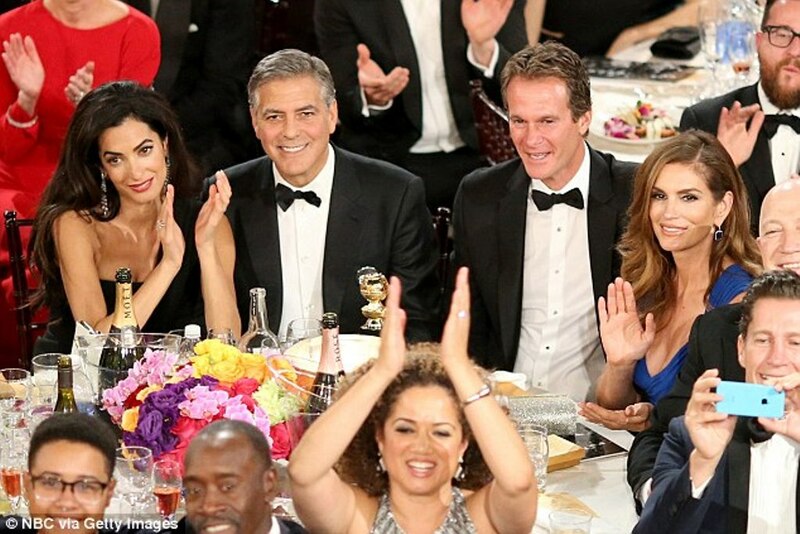 Hollywood, just like any other business enterprise, cares more about quarterly returns than issues of social justice. Because of this, I stopped watching most contemporary Hollywood productions long ago and prefer independent and foreign films by a long shot (also, the acting is often much better quality). 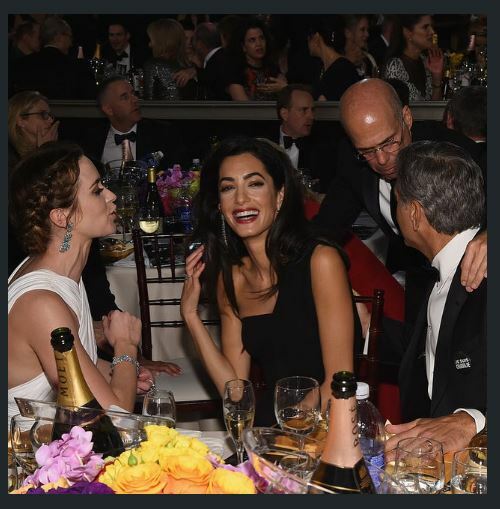 That said, I had no idea, until Tina Fey and Amy Poehler’s comments, that Amal had once worked to *defend* Enron and Arthur Andersen. I looked it up – it appears to be true. If she genuinely cared about human rights from the start, she would never have worked for a firm that put her in that position. I realize that she comes from a place of massive privilege (a wealthy family who provided her with an easy road to her accomplishments) and has defended other wealthy clients, but this is too much. I think I’ve lost all respect for her, now. 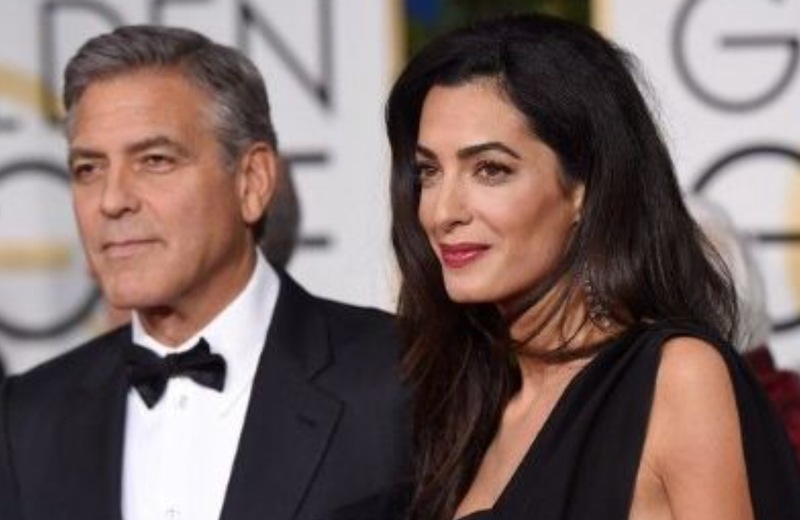 It looks like George just shopped around until he found an educated, privileged woman to marry. His PR team is marketing her alleged “human rights accomplishments” really hard in the press, but I’m not buying any of it anymore. She’s just another lawyer working as part of famous legal teams for hire, using the press to increase her influence among the wealthy elite. By the way, there are some articles on the topic of Charlie Hebdo and the socioeconomic barriers faced by certain ethnic groups in France that are great reads and point to an underlying discontent that likely spawned the anger that lead to the massacre. For instance, check out Chris Hedges’ article titled “A Message From the Dispossessed,” published yesterday. I’ve been to Paris enough to have seen the ghettos where a lot of the poor (and immigrant) north Africans and Arabs live. In fact, their situation is not unlike that faced by minorities in similar economic circumstances here in the U.S. 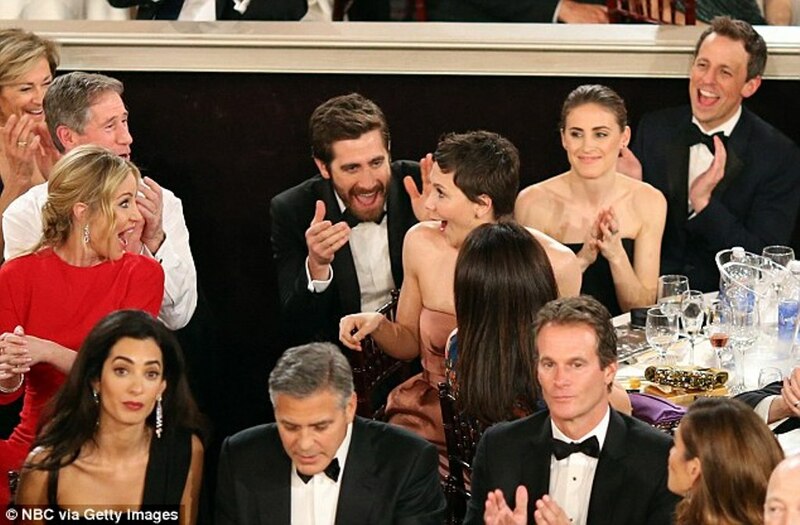 I thought they seemed quite awkward last night. I liked her dress, but she was having to adjust that train on her shoulder a lot, and also touching her hair quite often. 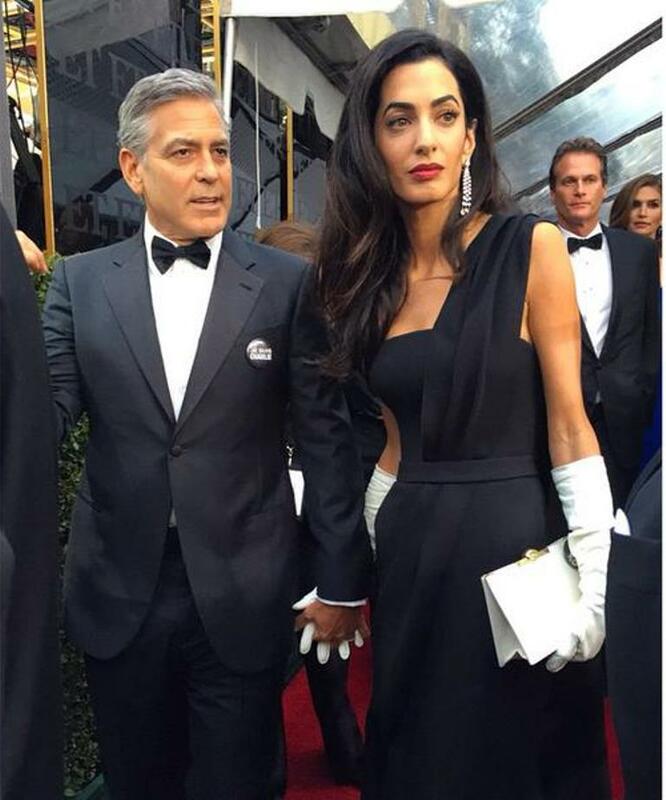 Although I like the gloves, I really didn’t like them with that dress. 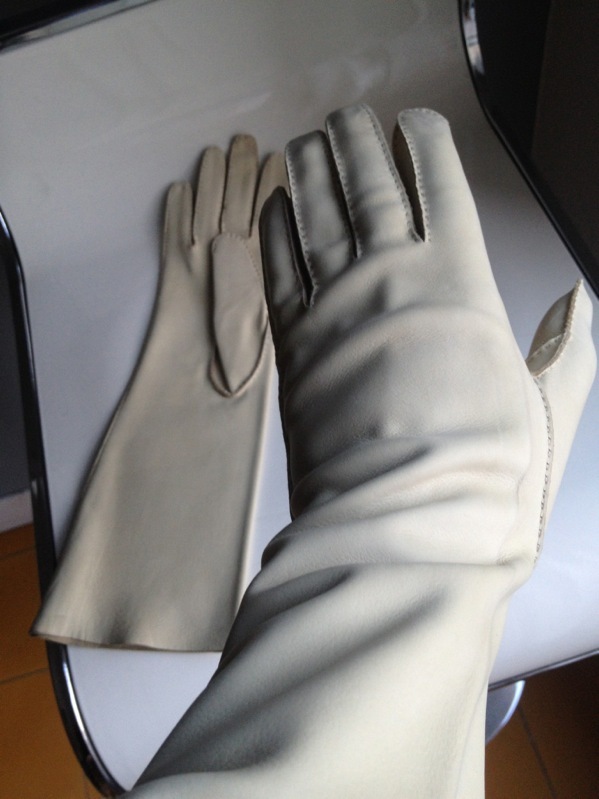 I think a different color would have been better, or some sheer gloves like the ones that Carolyn Besset wore at her wedding so many years back. 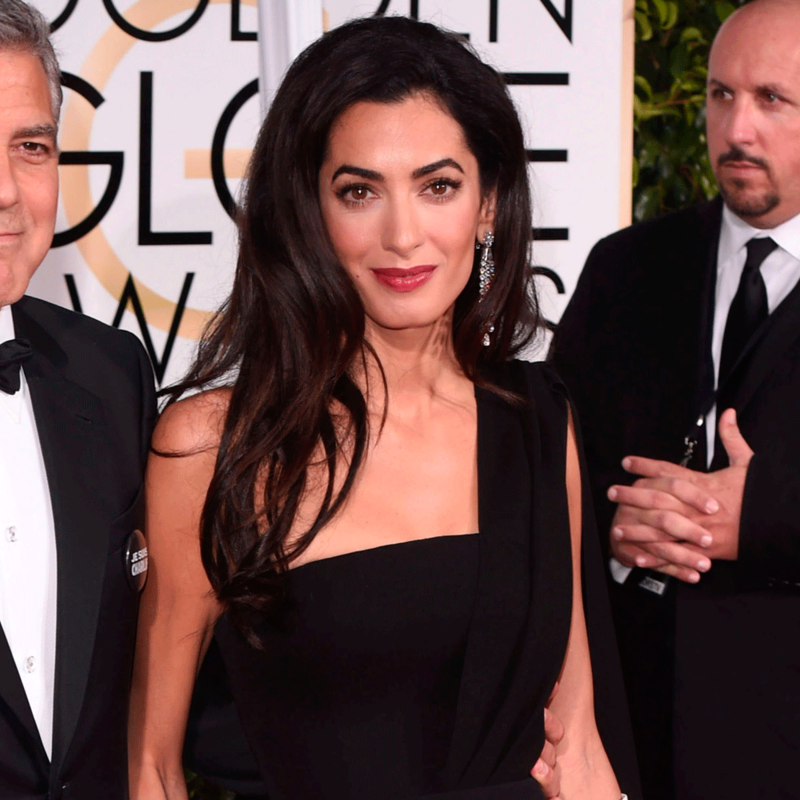 Amal’s makeup was perfect! I wonder what shoes she was wearing? Also, didn’t you think that t-shirt thing that Ryan Seacrest gave them was a bit odd? 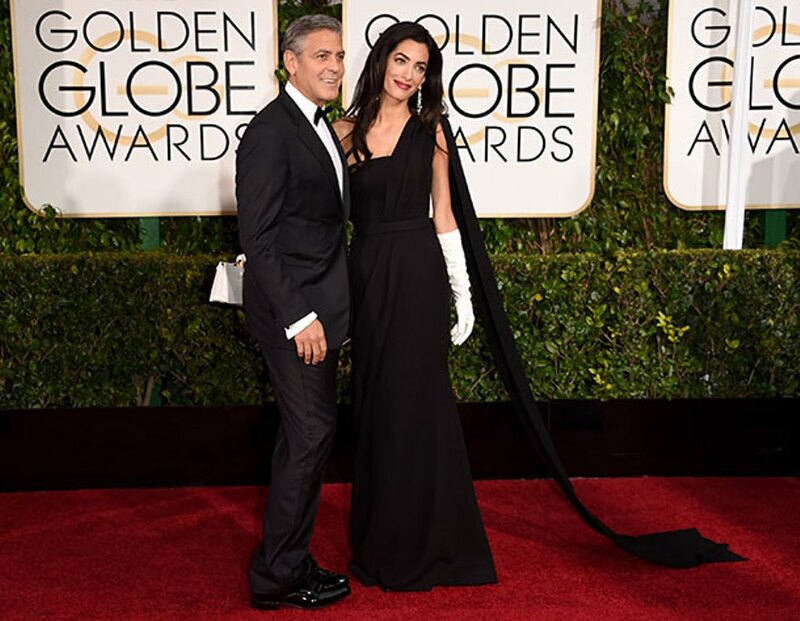 In my opinion her Golden Globe’s look was a bit of a miss. 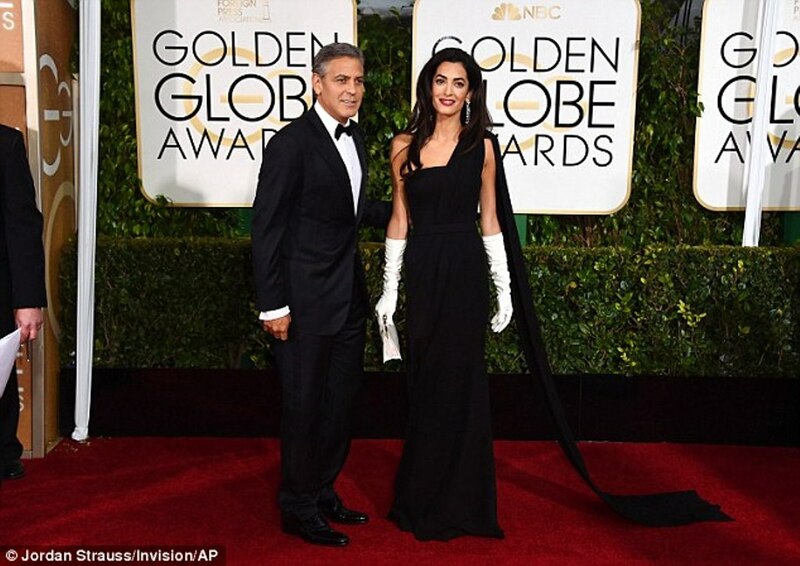 Beautiful dress, but the white gloves and white evening bag did not work. An elegant dress like that does not need a lot of accessorizing. 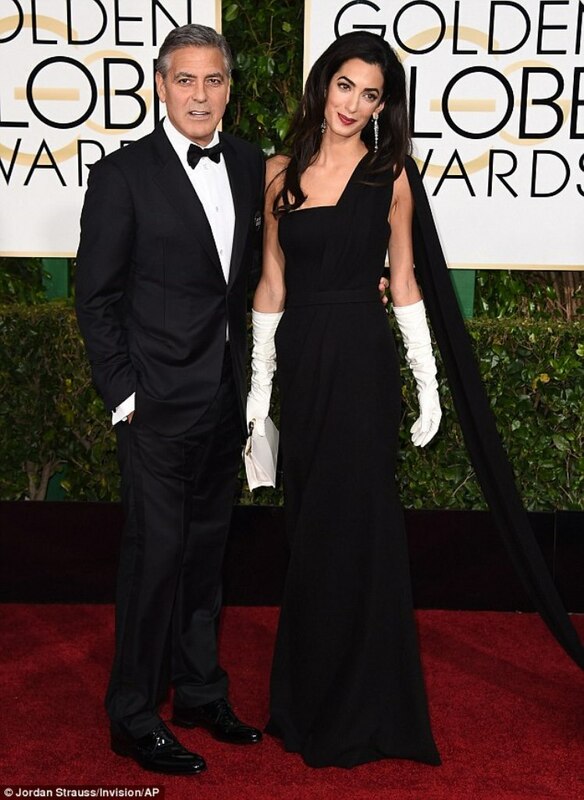 Black gloves may have been ok, but the stark white was too much of a contrast. Also, her makeup was a bit too harsh. Agree with everything you say, Lulu. There was too much going on, on her delicate frame. The gloves are embarrassing , they are huge, too big for her !!! It seems that he just finished washing the dishes !!! Found his size has the skeletal arms !!! 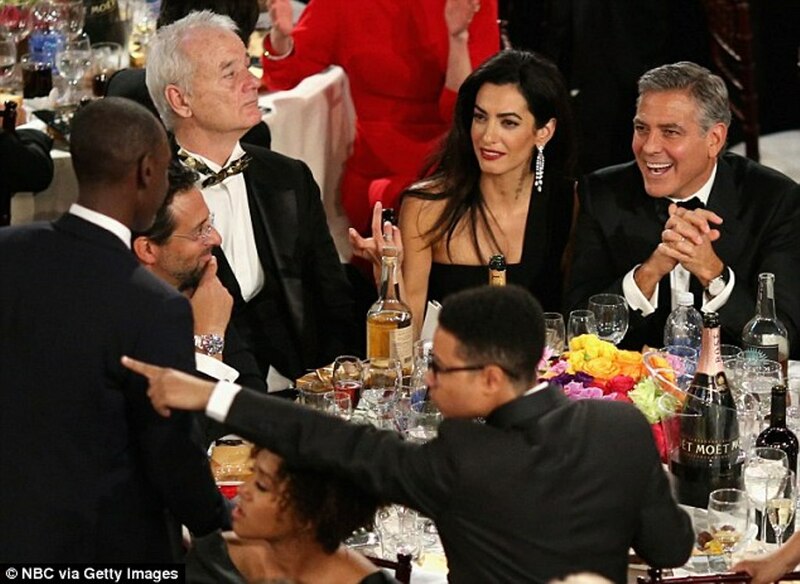 Amal …..eat !!!! I think he got it all wrong , dress , hair , jewelry !!!! 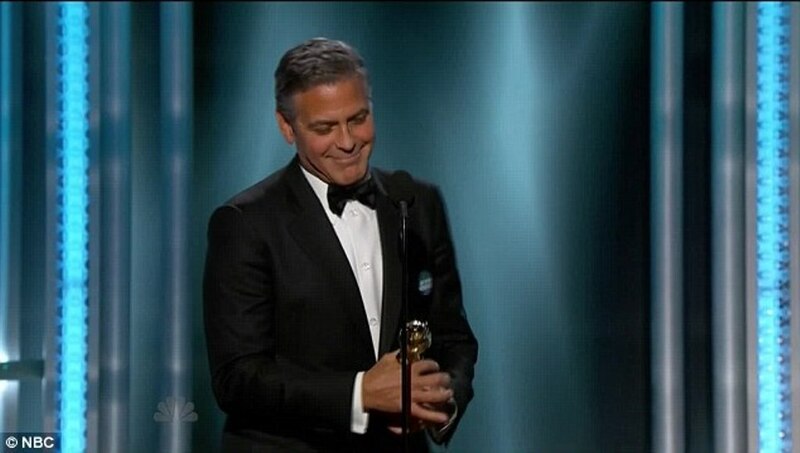 George instead I found it more ‘ than usual cute !!!! She is very elegant and she looks perfect, Take care both for your lovely story of love. 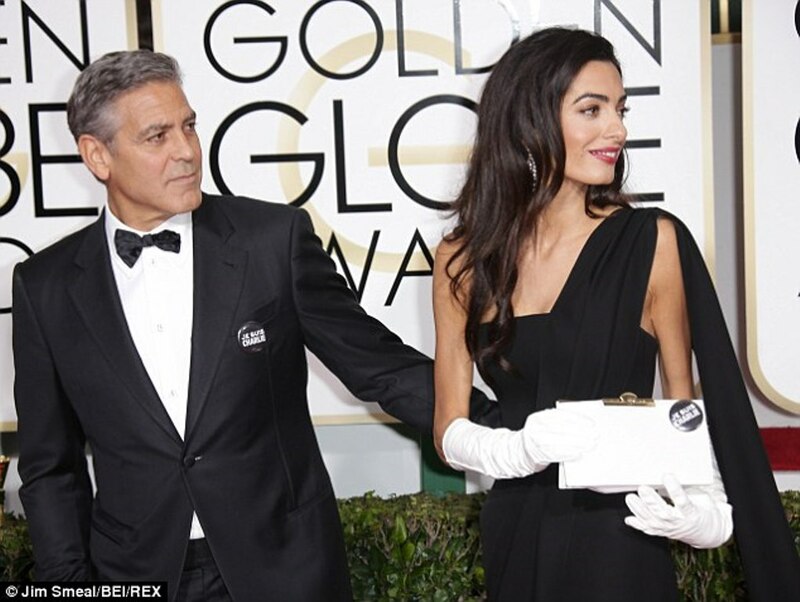 It was raining that would explain her hair , I think Amal knew that all eyes would be on her and kept it chic but simple. I think she wore what she wanted good for her. 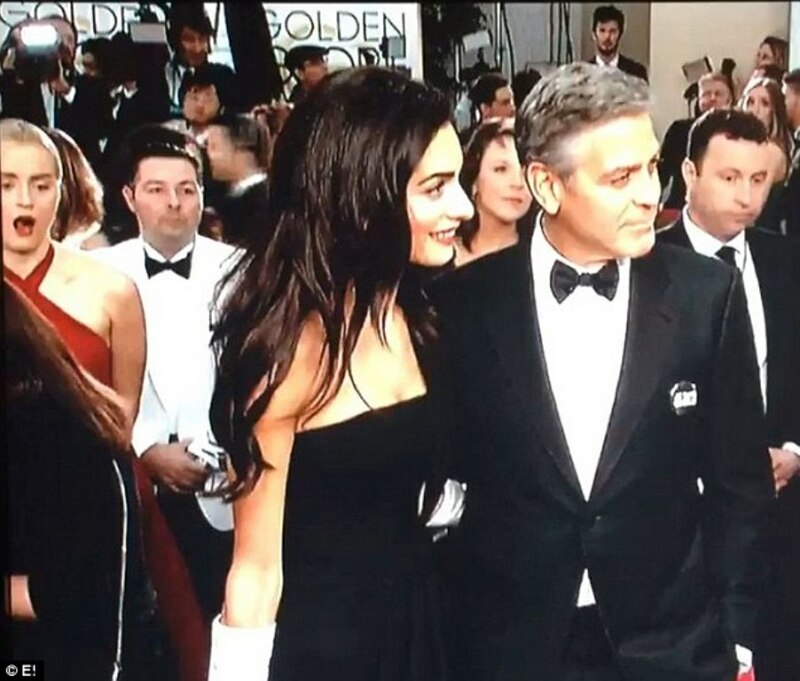 Amal is stunningly beautiful. She stands out regardless of what she wears. That said, last night’s ensemble was nothing short of Booorrrrring !!! I was expecting so much more. No show stopper here. She tried for regal and failed. That dress did nothing for her. It simply did not translate well on camera. Those gloves would of worked much better in either black or rich pink and they should of been tight fitting. The purse looked like it came from the dollar store as did the earrings. Knowing it was raining, she should of worn her hair up or back. She looked really uncomfortable and out of her comfort zone. 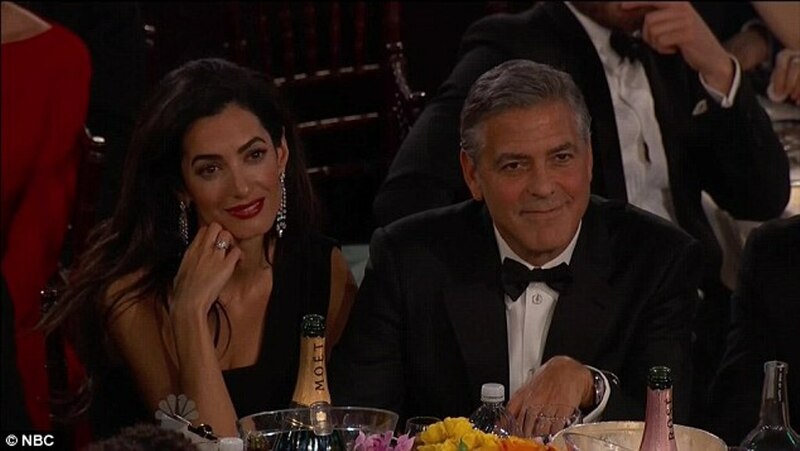 In spite of all that she was the most beautiful women at the Globes (along with Amy Adams & Jennifer Lopez). 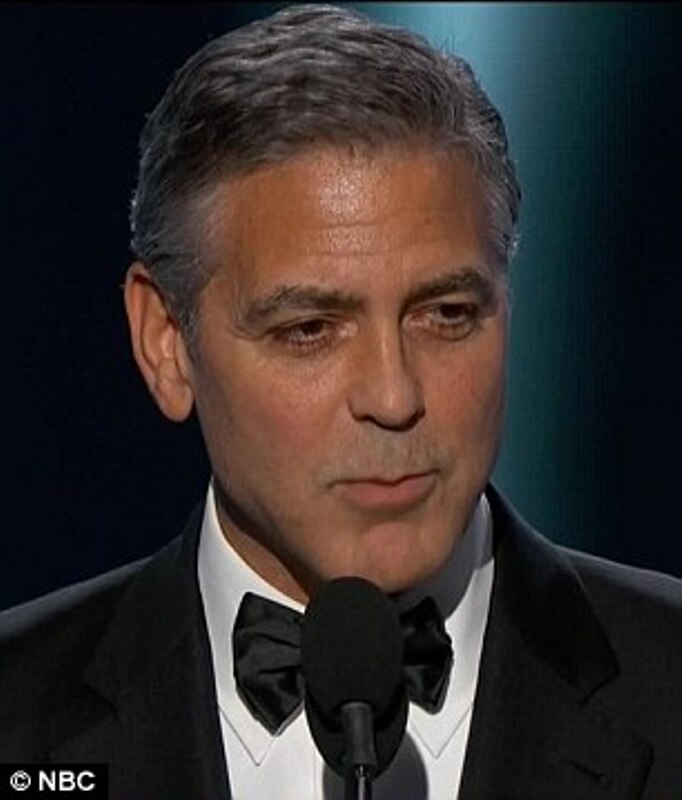 George’s speech was uneventful. The intent was there but the delivery fell short. He was all over the place and seemed awkwardly unprepared and nervous as hell. I mean this award was not a surprise so he could of prepared better. 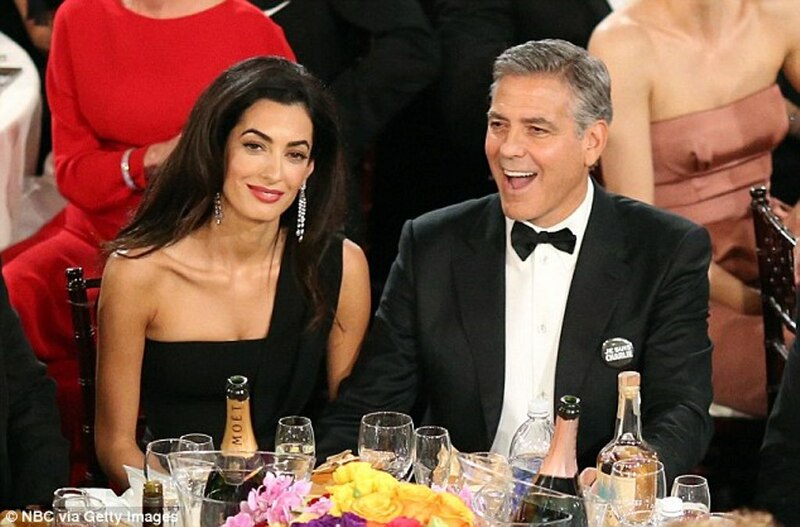 The comment he made about Amal was the same comment he made at that dinner in Venice – ‘proud to be your husband’ blah blah. And finally the Ryan Seacrest T-shirts. 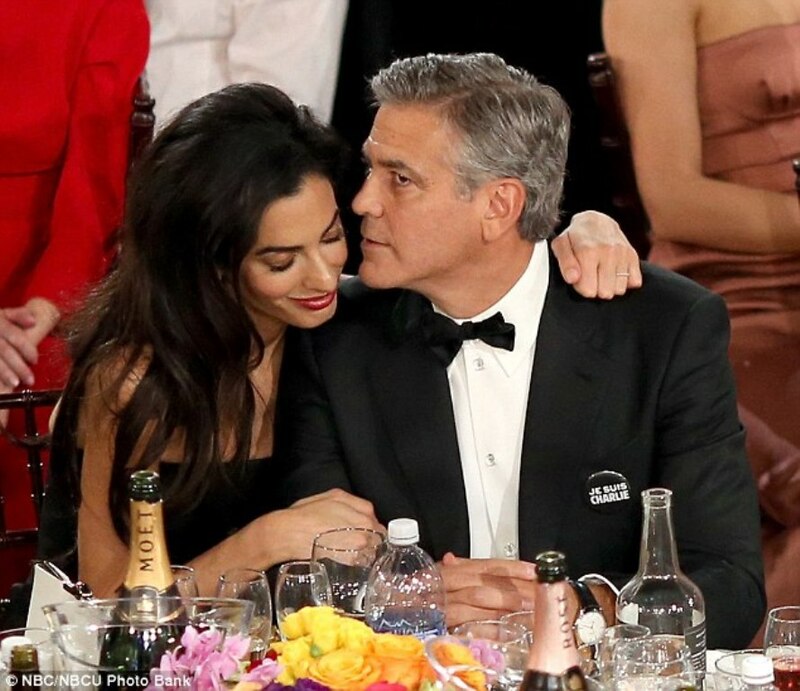 Insulting to Amal and all the other CG women he dated. I felt bad for them. 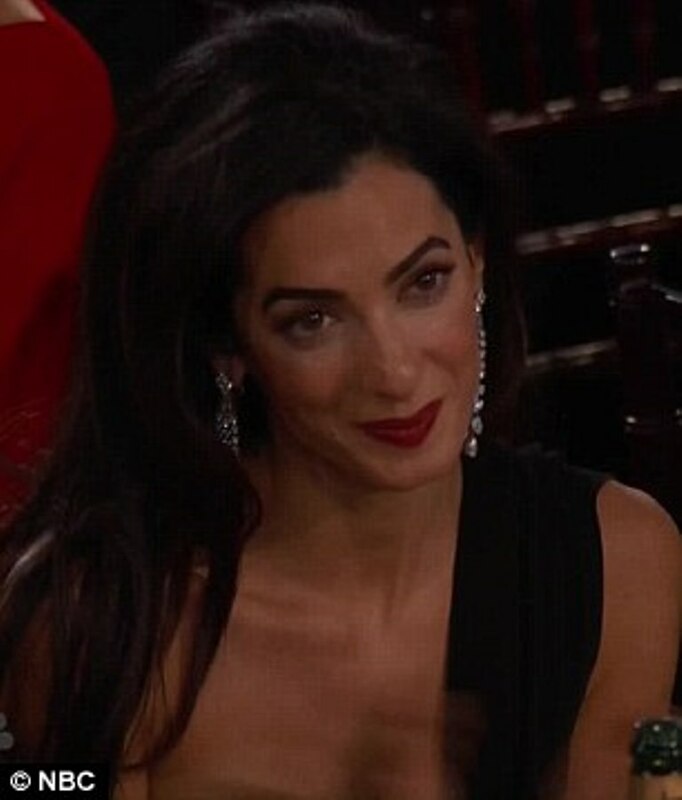 I think we all agree that we can’t wait for the next event when we can see Amal hit a home run. I want her to look the best she can. 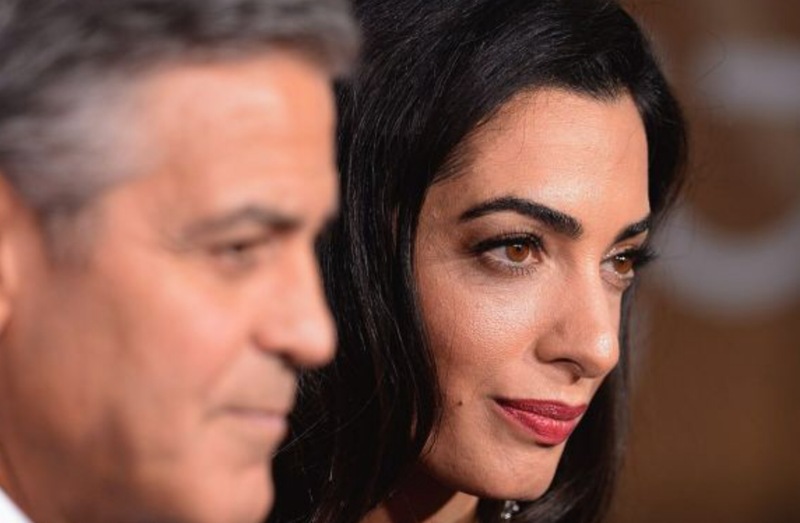 Did anyone else notice that Sarah Treem sort of resembles Amal. I saw her give the speech for The Affair and I was surprised to see that they look alike. Maybe from same ethnicity. 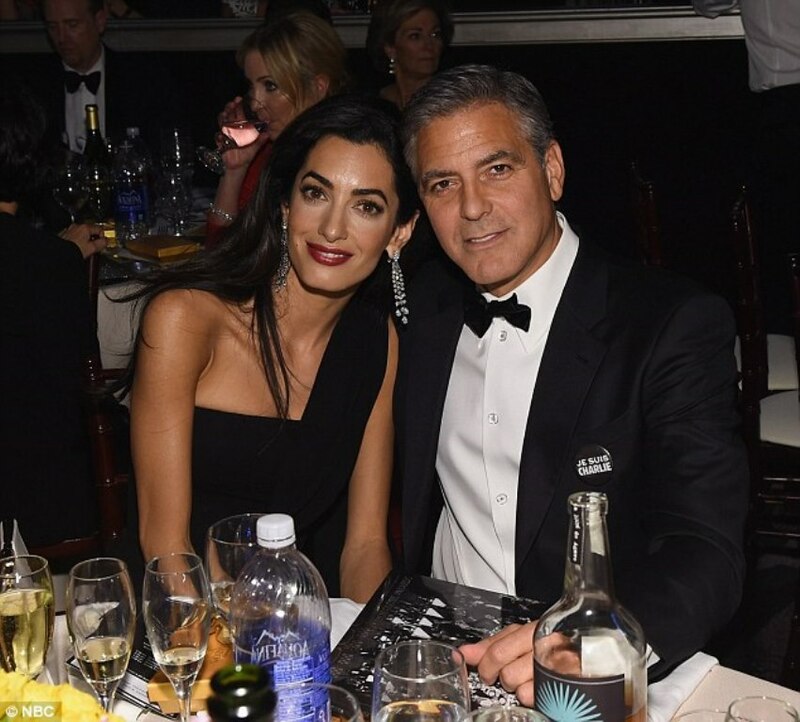 Oddly, Amal never wears her hair up or back. I’ve wondered what it would look like if she did. The long locks get a bit boring, over time, and I have to agree with everyone that her hair looked less than optimal in the photos above. 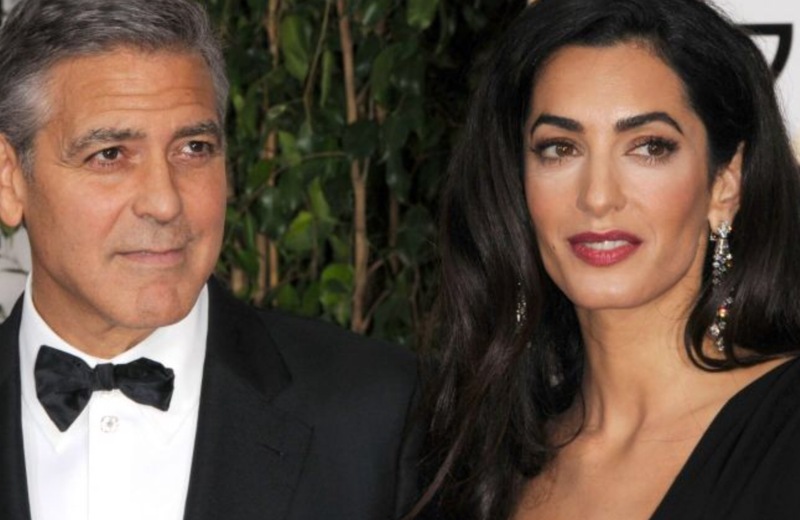 She’s too thin for the dress – you’re right that it did nothing for her. The outfit would have looked better on her if she was a bit more voluptuous. 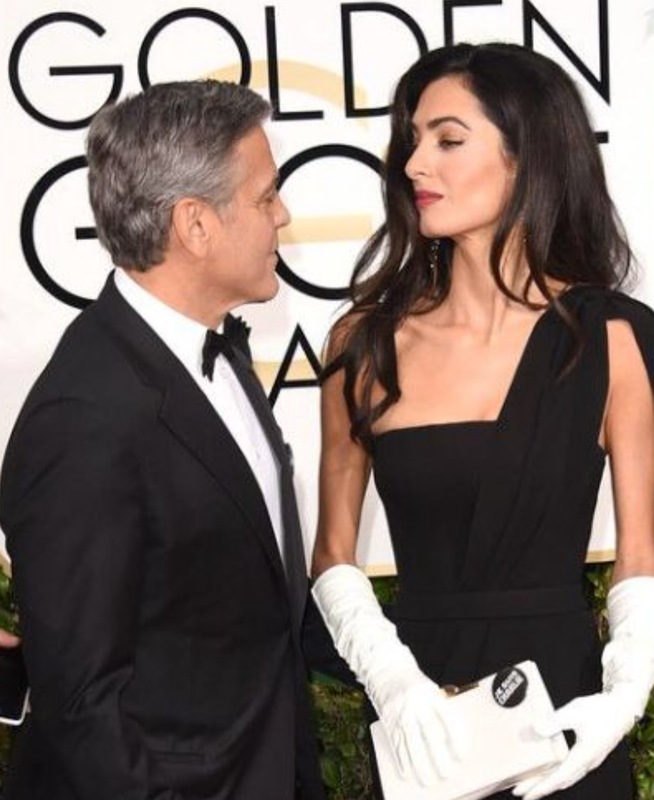 As it is, her gaunt face sometimes reminds me of Michael Jackson’s in his later years (after he straightened his hair, bleached his skin, had some plastic surgery, and became anorexic). I LOVED her makeup. The dress fitted nicely. 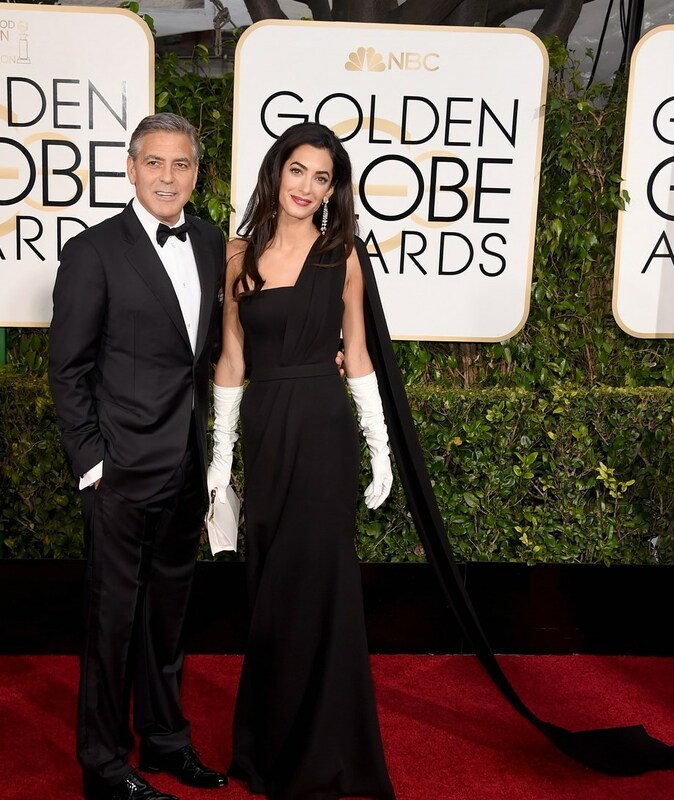 -Those ill-fitting and outdated opera gloves, should be left at home (she admitted on the telecast that she herself had added them to the look: that was a mistake). They were unnecesary for the look (a nice, blingey bracelet would have been perfect though) and didn’t match the dress modern aesthetic. 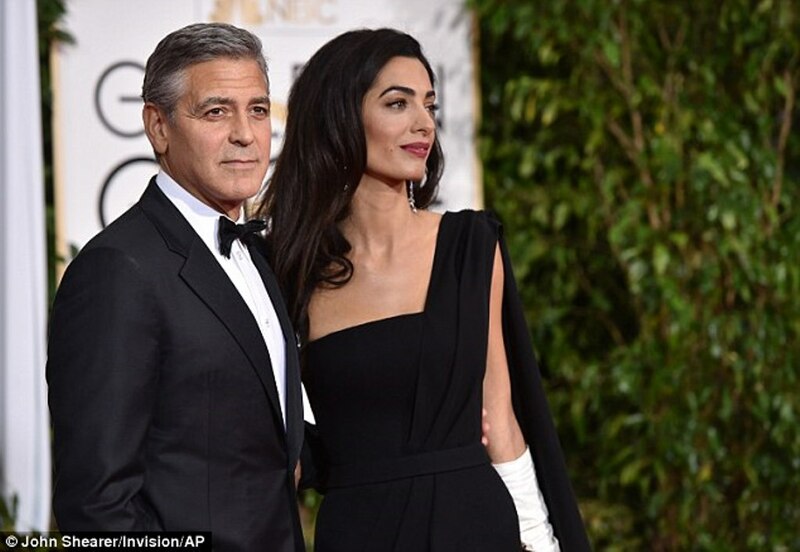 -The dress itself was boring, I understand that she didn’t want to steal George’s thunder but still, for a woman that’s been fashionable even before she met Clooney, and dressed so incredibly on her whole wedding weekend festivities, it’s such a shame to such a blah look was a disappointment. -THE FRIZZY HAIR! Unforgivable! I know she feels that her hair is her crowning glory (and rightfully so) and she tends to style it down, but when in fear that the weather may wreak havoc on your blow-out, go for a sleek updo. With her long-neck and exotic features, she would’ve looked stunning. 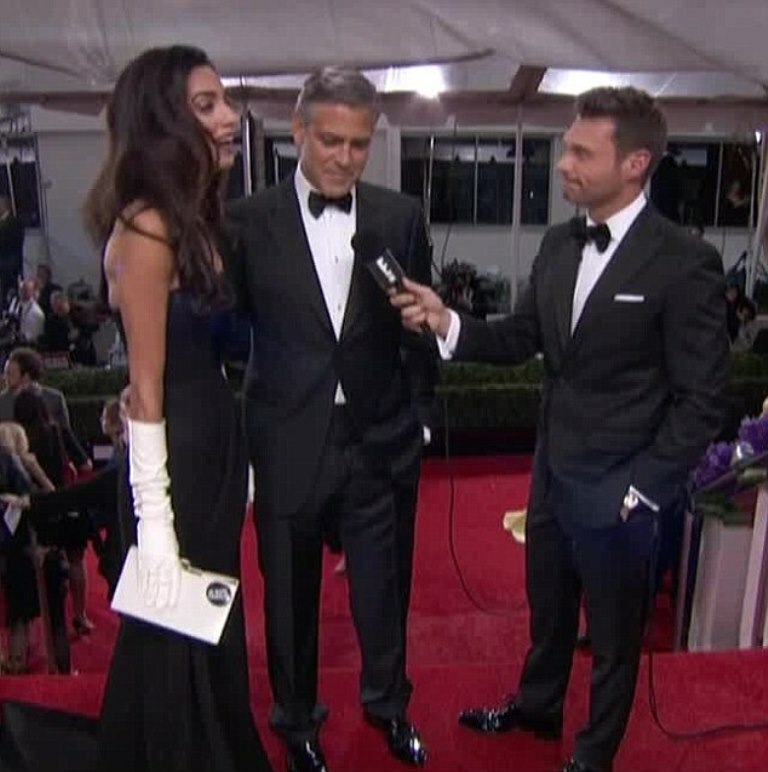 I had a feeling during Mat Interview that Gergoe didn’t want Amal to speak at all.. Notice her body language.. She wants to speak but Geroge steal the mic. 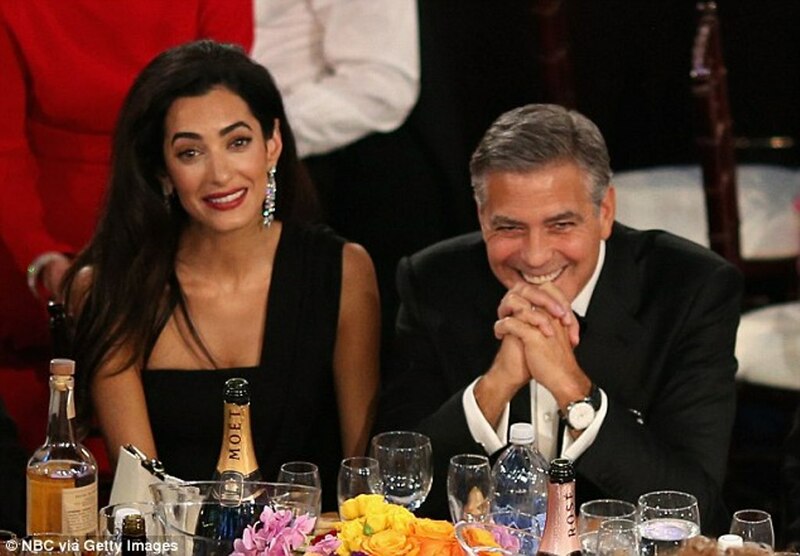 I just wonder when Amal will have the opportunity to speak when she is next to him in the public life. I did not get the same impression, Zuzu. I thought, it was more because, it was very noisy and hard for them to understand what the interviewer said. 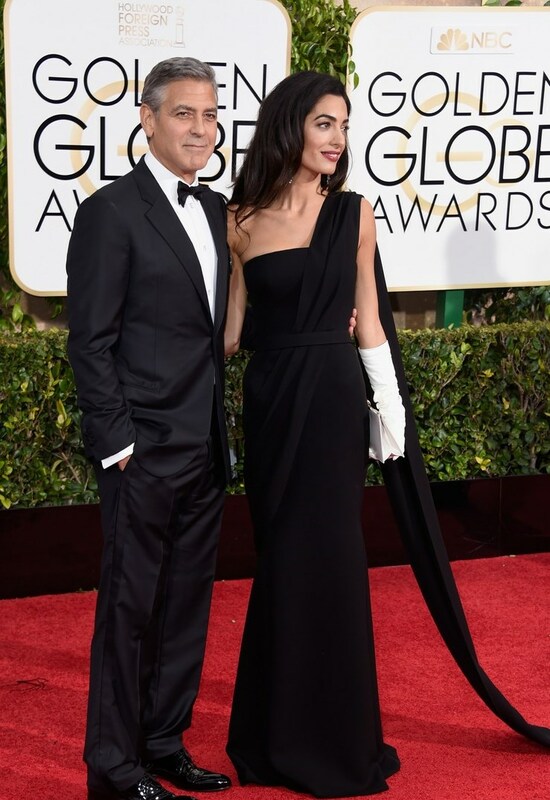 I think Amal looked elegant and stunning. I get it. 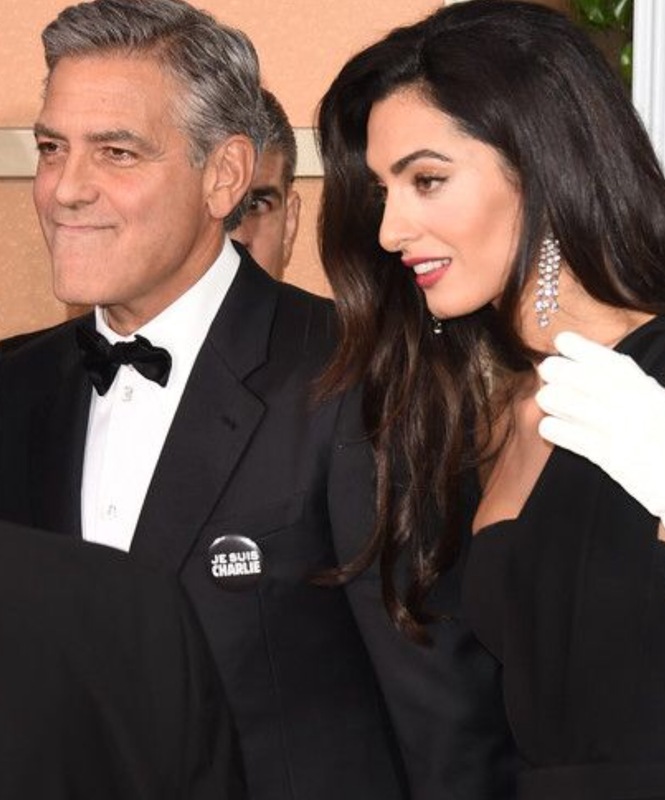 I feel she dressed more conservatively because it was her first Hollywood award show and their reason for attending which was for George to receive the prestigious Cecil B. DeMille award. 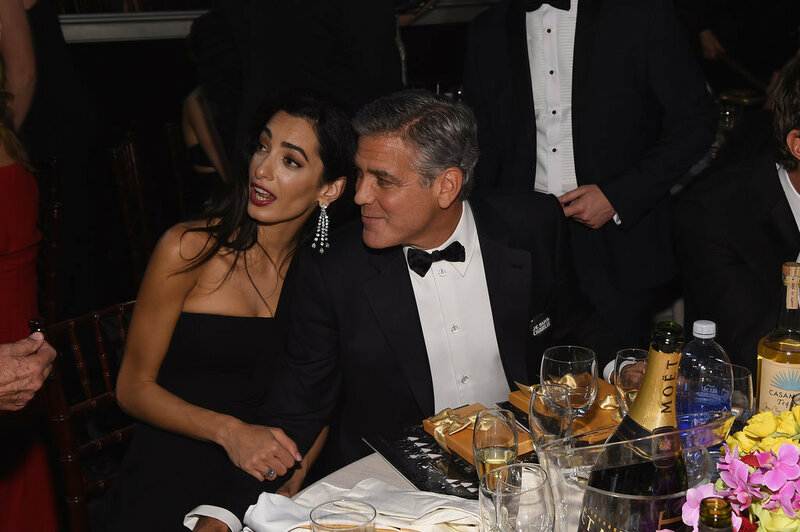 Amal possibly wanted to be a bit more low key with her attire since it was her husband’s night to shine. However, everyone was looking to see what she was wearing. 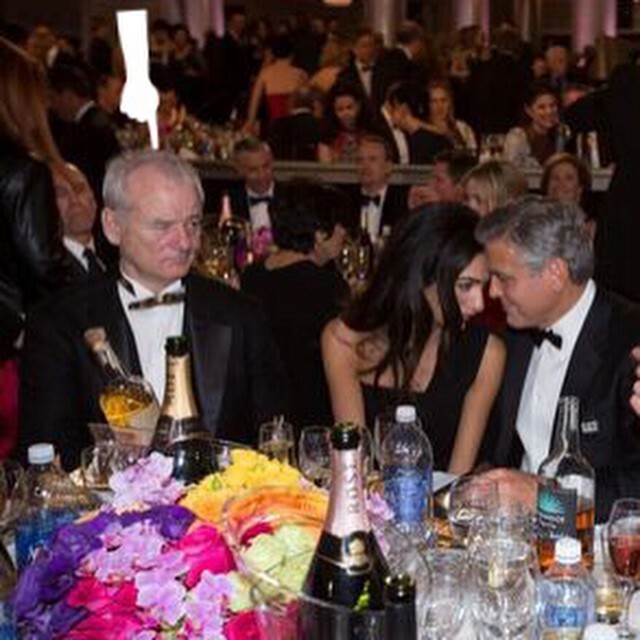 There is a big fascination with Amal here. 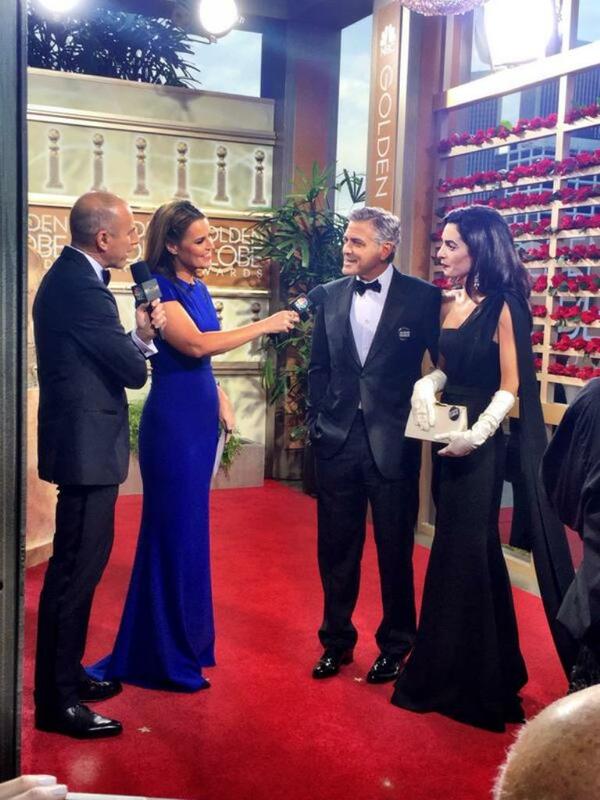 The gown appeared to be velvet and I loved her gloves. 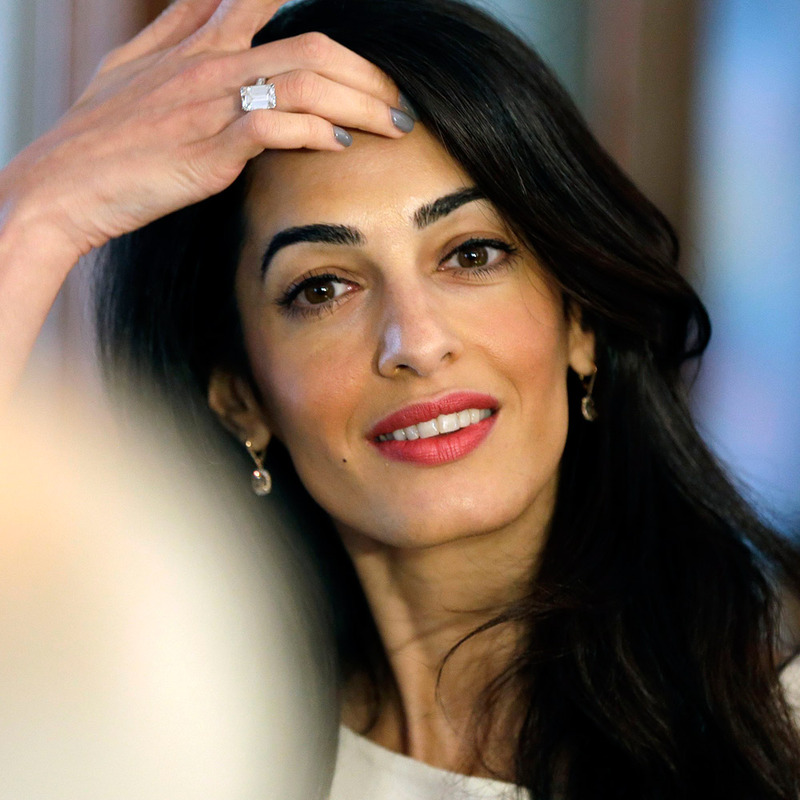 Bravo Amal!